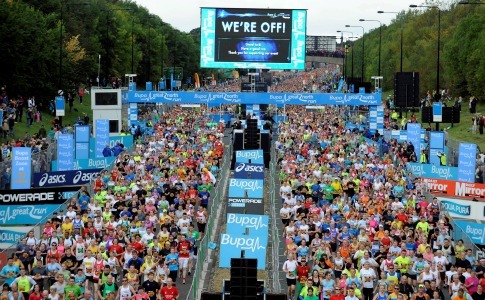 If your new year’s resolution is to get fit, give it a kick start by entering the ballot for the Bupa Great North Run 2012, Britain’s biggest running event which takes place on Sunday September 16 – allowing over eight months to get into shape for the start line! The ballot for the world’s most popular half-marathon is now open and will close on Monday February 6. Last year’s event attracted a record number of applications with over 100,000 people vying for 54,000 places. The Bupa Great North Run 2012 is open to anyone aged 17 to 70 plus, from rookie runners to Olympic athletes. Celebrity runners have included Gordon Ramsay, Nell McAndrew, X Factor winner Joe McElderry, Radio 1 DJ Scott Mills and BBC newsreader Sophie Raworth, following in the footsteps of athletics greats such as Mo Farah, Sally Gunnell and Haile Gebreselassie, the greatest distance runner in history. Visit www.greatrun.org to enter the ballot for the chance to pound the famous course through Newcastle, Gateshead and South Shields, crossing the iconic Tyne Bridge with the Red Arrows flying overhead and thousands of cheering spectators lining the streets. If a half-marathon is too ambitious, the Bupa Great Run Series 2012 offers seven other running events this year, including the popular 10k Bupa Great Manchester Run in May, all providing great motivation to start or improve running, get fit and lose weight, as well as raise money for good causes. If you are lucky in the ballot then you will be needing our half marathon training plan.